The record is made up of 1 volume (298 folios). It was created in 5 Aug 1937-30 Apr 1942. It was written in English and Arabic. The original is part of the British Library: India Office The department of the British Government to which the Government of India reported between 1858 and 1947. The successor to the Court of Directors. Records and Private Papers. The volume’s letters, telegrams and other papers relate to the installation, maintenance and extension of British air facilities along the Arab coast of the Gulf. The principle correspondents in the file are the Political Resident A senior ranking political representative (equivalent to a Consul General) from the diplomatic corps of the Government of India or one of its subordinate provincial governments, in charge of a Political Residency. , the Political Agent A mid-ranking political representative (equivalent to a Consul) from the diplomatic corps of the Government of India or one of its subordinate provincial governments, in charge of a Political Agency. at Bahrain, the Political Officer on the Trucial Coast The historic term used by the British to refer to the Gulf coast of Trucial Oman, now called United Arab Emirates. , and representatives of the Royal Air Force [RAF] and Imperial Airways (referred to after 1939 as the British Overseas Airways Corporation [BOAC]). Correspondence in the first part of the volume (folios 1e-50) concerns a fire at the RAF petrol store at Doha in August 1937, resulting in serious burns to a number of men. Some of this correspondence also refers to an injury to Nasr bin Jassim [Nasr bin Jāsim Āl Thānī], brother of Shaikh ‘Abdullāh bin Jāsim Āl Thānī, the ruler of Qatar, suffered while riding his horse during a parade prior to travelling to Zubarah 18th-century town located 105 km from Doha. to fight against the Bahraini forces. Agreement was reached between British Government officials and the Adviser to the Bahrain Government, Charles Belgrave, for Nasr bin Jāsim to travel to Bahrain for medical attention. Most of the later correspondence in the volume is dated to the Second World War, and relates to the creation of new or improved RAF facilities in the Gulf in early 1942. These included extended facilities, capable of accommodating bomber squadrons, at Bahrain and Sharjah, and new facilities at Dubai (folio 131). 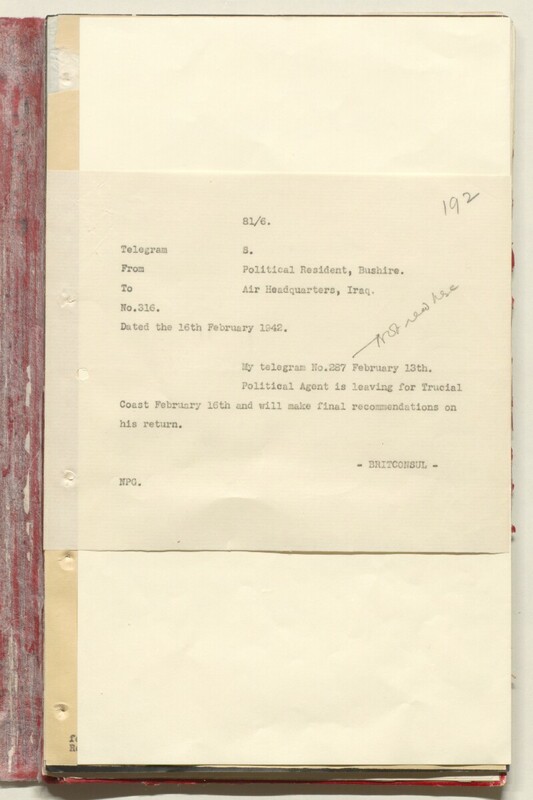 Correspondence also records the arrangements made with the Bahrain hospital and American Missionary hospital in Bahrain, to accommodate RAF patients as required. The contents of the volume are arranged in approximate chronological order, from the earliest items at the front of the volume to the latest at the rear. There is a set of office notes at the end of the volume (folios 266-97) which mirror the chronological arrangement. Foliation: The volume is foliated from the front cover to the inside back cover, using pencil numbers in the top-right corner of each recto The front of a sheet of paper or leaf, often abbreviated to 'r'. . This foliation system has been adapted from an earlier pagination system. The following foliation anomalies occur: ff. 1a-1e, 34a, 34b, 84a, 85b, 139a, 139b, 193a, 193b. The following folios are missing, as a result of the volume’s original pagination system: ff. 106, 212, 231. The following folios are fold-outs: ff. 47, 48, 65, 93, 104, 138, 173, 174, 179, 211, 230, 268, 277, 278, 280, 282, 287.